From plotting your route to wearing reflective gear, learn how to stay safe while riding your bike. 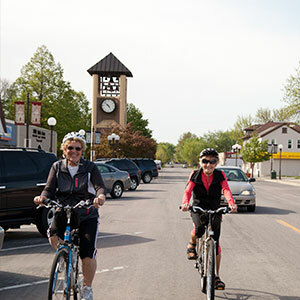 Biking is one of the best ways to get around town. Whether you’re commuting to the office or joy riding on the bike path, you can enjoy the wind on your face and the knowledge that you’re doing something that’s good for your health (and nearly free!). But if you’re just venturing out on two wheels for the first time in a while, the idea of riding on bumpy trails or busy roads might be daunting. 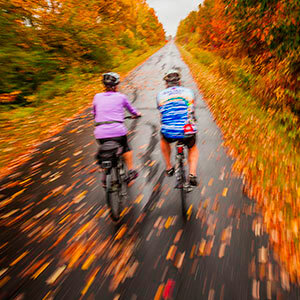 Don’t let fear interfere with your plan to get pedaling. Here’s a quick recap of bike safety, what equipment you might need on the road and the rules of the road (hint: stop signs apply to bikes too). Garage sales and used-bike stores are great places to pick up used bikes for reasonable rates. If you’re primarily riding on city streets, look for a bike that lets you sit more upright and get on and off easily, such as a city bike, a hybrid or a cargo/utility bike. Also, be sure the bike fits you and is in good working order. If you’re unsure of the proper size, buy from a bike shop, where staff can fit you and do a tune-up for a reasonable fee. 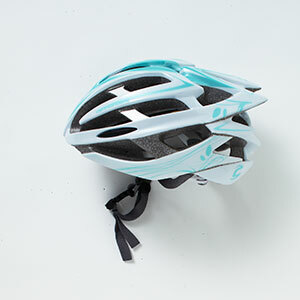 Most importantly, always wear a helmet—even if you’re just going around the block. All helmets are required to meet minimum safety standards set by the Consumer Product Safety Commission, so choose one that fits well and is comfortable. If it’s been a while since you rode a bike, hop on a bike path or take a few turns around a local park to reacquaint yourself. Visit traillink.com to find trails near you, and consider using the "bicycling" option on Google maps to plot your optimal route around town. "Keep in mind that your best route may not be the one you take in your car or on the bus," notes Elly Blue, a blogger for Bicycling magazine and author of Everyday Bicycling: How to Ride a Bike for Transportation (Whatever your Lifestyle). As a cyclist, you’re required to follow the same rules that apply to cars. Always ride with traffic, and if you have to move onto the sidewalk, get off and walk your bike. If you’re in a bike lane, use hand signals to indicate turning or stopping (learn the basic signals at be-safe.org). "Always ride in the middle of the bike lane and hold your line without swerving around," Blue says. "That indicates to drivers that you’re a vehicle in the bike lane and that they should give you room. It also helps you avoid drivers who might open a car door into your path of travel." Wear bright, reflective clothing and invest in a bike light for the front and back of your bike. Be consistent with the colors cars use—red lights for the back and white lights for the front. You can also purchase stick-on reflectors to mount on the bike itself for additional visibility. It’s important to be careful when you’re riding in the road, but once you get the hang of it, you may find that it’s an enjoyable way to get a dose of aerobic activity and reduce stress while getting to your destination. 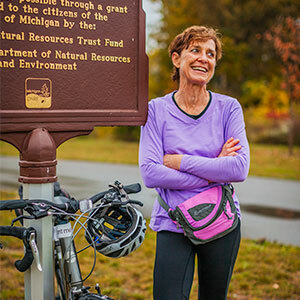 "Biking gets your blood flowing, and is a great way to improve your mental health," Blue says. "It doesn’t have to be all about the gear and doing it right—it can just be about feeling good and having fun."